Businesses looking to start up or expand in the Meramec Region will find an abundance of financing tools – ranging from loans to tax credits – to assist them along the way. This loan program assists new and expanding businesses with projects involving fixed assets, such as land, buildings, machinery and equipment and debt refinance. Total project may be from $50,000 and up. The applicant must participate with a private lender. Typical loans require at least 10 percent investment by the applicant, 50 percent by the private lender and the remaining 40 percent (or a maximum of $5,000,000; for small manufacturers $5,500,000) by SBA. The SBA portion of the 504 loan will be at a fixed rate for a fixed term, up to 25 years depending on the use of proceeds. One job per $65,000 must be created or retained or must meet other economic goals. SBA loan applications are prepared by the MRPC staff. Contact: Maria Bancroft, Meramec Regional Development Corp., 4 Industrial Drive, St. James, MO 65559 at 573-265-2993 Ext. 114. This is a local fund designed to provide loan money to small businesses in Crawford, Dent, Gasconade, Maries, Osage, Phelps, Pulaski and Washington counties in order to induce private lenders’ participation in projects that will retain or create employment. The Revolving Loan Fund can provide up to 40 percent of the funding or a maximum of $100,000, funding 50 percent with a private lender and the applicant supplying 10 percent. One job must be created or retained for each $20,000 of RLF requested. Loan applications are prepared and serviced by the MRPC staff. This program guarantees loans by eligible local lenders to businesses that benefit rural areas through creation and maintenance of employment. Priority is given to applications for loans in rural communities of 25,000 or less population. Maximum guarantee is limited to $25 million. For more information, contact your local USDA office. The Missouri Department of Agriculture programs provide a variety of loan, loan guarantees and grant programs for agribusiness pursuits. Contact: Missouri Department of Agriculture, P.O. Box 630, 1616 Missouri Blvd., Jefferson City, Mo. 65102-0630, (573)751-4762. This program facilitates a lower interest rate on loans to approved businesses. Eligible businesses include new, existing or expanding firms. 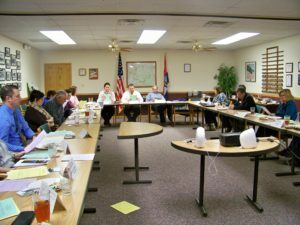 Contact: Missouri State Treasurer’s Office, P.O. Box 210, Jefferson City, Mo. 65102, 573-751-2372.